Leeds Carnegie A: Ollie Richards(1T), Curtis Wilson(1T). 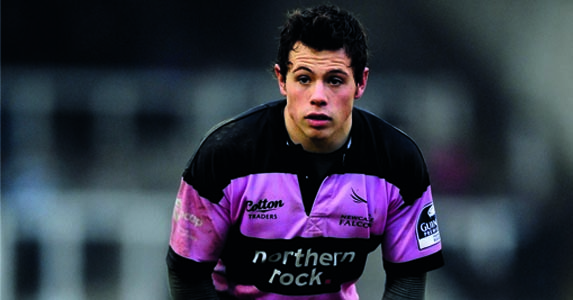 Newcastle Falcons A: Ben Frankland(1T), Joel Hodgson(2C, 2PG), Sione Mafi(1T), Myles Scott(1T), Sep Visser(1T). Sale Jets: Matty James(2C, 5PG), Henry Thomas(1T), Rob Miller(1T). Northampton Wanderers: Joe Ford(1C, 3PG, 1DG), Charlie Sadler(1T). Worcester Warriors A: Chris Surman(2C), Matthew Kvesic(1T), Louis Silver(1T), Will Bowley(1T), Charlie Hayter(1T). Leicester Tigers Development: Ed Rolston(1T), George Ford(1T, 4C, 2PG), Dante Mama(1T), Penalty Try(1T). Exeter United: Josh Matavesi(1T), Ryan Davis(1C, 6PG). Harlequins A: Ross Chisholm(1T), Luke Wallace(1T), Miles Mantella(1T), Pete Browne(1T), Rory Clegg(5C, 1PG), Benjamin Urdapilleta(1T), Mark Lambert(1T). London Irish A: Jon Fisher(1T), Brian Blaney(1T), Aled Thomas(2PG). Bath United: Paul Roberts(1C), James Tyas(1T). London Wasps A: Will Robinson(2PG), Jack Wallace(1C, 1PG), Tom Lindsay(1T). Saracens Storm: Ben Ransom(2T), Owen Farrell(4PG).